RO: Are the experiential sessions like grocery shopping and cooking primarily used as a time to practice coping skills and distress tolerance, or do you also process feelings and associations that come up during those activities? BM: All of the above. So I think of it a lot as using the PEOP [Person-Environment-Occupational Performance] model because of the fact that, you’ve talked and talked and talked about how “I couldn’t go grocery shopping before” or “I haven’t been in a kitchen in six months,” and so now we’re saying, essentially, okay, we’re going to go do this and we’re going to do it together, and it’s going to be supportive and you’re going to have your peers there supporting you too. So let’s go into the kitchen and you guys have to work together to collaborate to figure out what we’re going to eat because that’s how making meals at home sometimes works too you know, like what does everyone want for dinner? Okay, how do we make this work? RO: That leads to one of the issues I talked about in the first article; from my understanding, some people in residential settings aren’t yet ready for the kind of experiential interventions you just described, but those interventions become harder and harder to access as a person moves down the levels of care. In your experience, have you found that to be true with your clients? BM: Yes, it is. Ultimately that’s why we structured our program to be as multidisciplinary and supportive as possible, the idea being that patients get to do the majority of refeeding and stopping the cycle of behaviors while inpatient, while they have 24/7 support, and then as they’re able to be medically stable, then we start gradually stepping them down to lower levels of care with less supervision. That’s why it’s so important, too, for people to have those opportunities to simulate things, to try and have the opportunity to fail before they’re out of treatment, because otherwise how in the world do we expect them to fully carry over those things, and how do we actually know if they’re able to implement the skills that they’ve learned? But ultimately, I guess the answer to your question is [that] it really depends on the patient, and if they aren’t ready to do those real-life OT sessions that the day hospital really highlights when they’re discharged, then they probably shouldn’t have been discharged. Or they should have been discharged with a plan to follow up pretty closely with OT in order to be able to do those tasks in a successful, supportive manner. RO: In your current workload do you run a mix of individual and group sessions? BM: I guess it depends on how you look at it. With my two services, I have between 12-14 patients at a time. I theoretically see all of them in a group five days a week, but then I also see all of them at least one time individually. So I’m doing quite a bit of both group and individual therapy. RO: For the individual sessions, do you mind telling me a little bit more about the goals you work on and how those sessions differ from the group work? BM: The typical goals that I usually come up with are the basic health and illness management goals: being able to identify triggers to eating disorder behavior, anxiety, and/or depression. I separate all those out, identifying the warning signs for each, and identifying appropriate coping strategies. Then the next step that I take with that is actually implementing those strategies. It’s one thing if you can list them, but you have to be able to be in a situation – which once again goes back to the PEOP and how having those simulation opportunities – where you can demonstrate them or at least trial them and see if they do or don’t work. 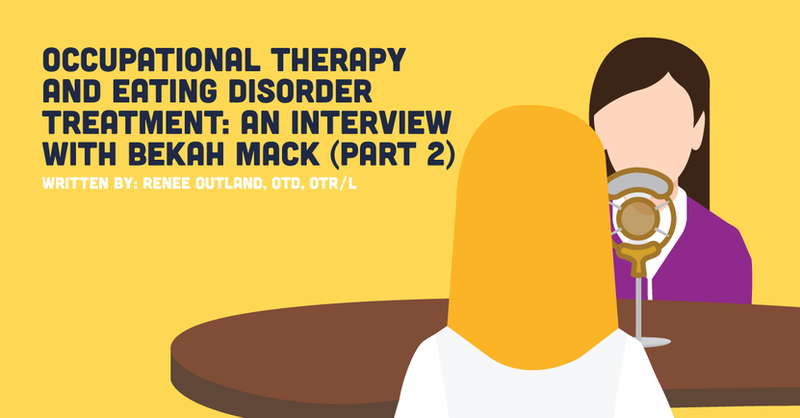 So, at first when I started here I thought it was kind of an odd thing for OTs to be doing – identifying triggers and warning signs and coping strategies – but that’s so foundational to not only your understanding of the patient, but also insight into the patient’s own awareness. It’s really hard to expect someone to just change their behavior if they don’t even understand what’s causing the behavior, or what’s triggering it – kind of unfair. So, that’s usually one of the basic ones, I also work a lot on figuring out how do we improve people’s role performance, how do we specifically include leisure and socialization back into their life, since that’s usually one of the first things to get cut [by the eating disorder]. We do some leisure exploration, I do a lot with making a balanced schedule, to figure out - how do I balance work, play, sleep, self-care, and make sure that I actually allocate time for meal planning, meal prepping, and eating the food. And then, as I mentioned, I do the meal planning, so we’ll make grocery lists, we’ll practice going to the store, we will make meal plans just practicing diversity, especially if people decide not to or can’t afford to go to day hospital, to at least get some of those things trialed before they leave so they can have a plan when they go home. RO: Earlier you mentioned the issue of motivation, and I agree that it is so crucial for OTs to address in our work because, even in recently published textbooks, I have read descriptions that lump true motivation and eating disorder motivation together when they’re not at all the same, so our lens of trying to figure out what actions and choices and reported beliefs are coming from a symptom vs. their true values and motivation is so important. I’ve been really encouraged to hear you describe the program at Johns Hopkins and the way they embrace that approach. BM: Exactly. If you look at the OTPF, it outlines everything we do in mental health and especially in eating disorders; [in order to treat eating disorders effectively] you have to look at values and beliefs, you have to look at the habits and the routines and the rituals, you have to look at the ADLs, IADLs, you need to look at socialization and relationships, you need to look at tons of activity analysis and real-life participation, you need to grade activities so that they can actually be supportive, you need to look at whether we’re in maintenance, and how do we either keep it going or facilitate things to promote recovery further. And that’s why OT is the perfect avenue for this work. What is Your Primary Motivation in Your Physical Therapy Career?